Natural-fiber bedding made of wool has many great properties perfectly suited for the bed because of wool’s unique structure. Wool is made of keratin, a natural protein. It has a spongy inner core that absorbs water vapor. The core is covered in overlapping scales that work like roofing shingles to shed water while allowing water vapor into the core. This is one reason why wool bedding can keep you warm and dry, even when it’s cold and wet. Wool is also extremely durable. A wool fiber can be bent in half 20,000 times before it breaks. Cotton can withstand 3,200 bends, and rayon only 75 before it breaks. This is why wool blankets can be passed down from one generation to the next. Wool bedding insulates without causing heat to build up, because of its airflow and humidity control. The human body is designed to regulate its temperature while asleep. 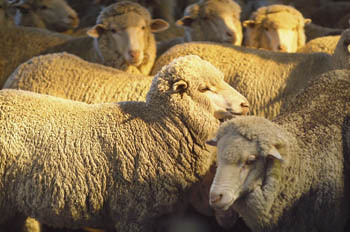 Be sure to choose bedding that supports this biological process- wool batting and wool blankets. Balanced airflow is an important part of temperature regulation. Wool bedding allows air to circulate so that the body can shed heat that naturally builds up as the body enters the sleep cycle. High thread-count sheets are silky to the touch and marketed as superior in all regards. But tightly woven sheets can block airflow. Wool blankets and duvets are ideal to keep you warm, yet promote good ventilation. Another important aspect of comfortable sleep is humidity. Although new synthetic fibers, like fleece, can be engineered to wick away moisture, they do not release it naturally the way wool does. Wool accumulates perspiration and other sources of moisture from the human body, and then releases it into the air as vapor.